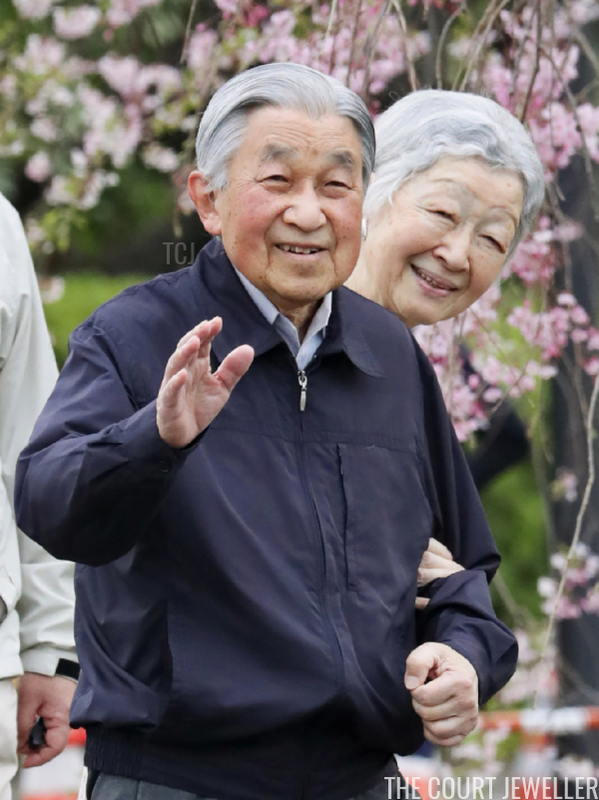 As Japan prepares to say farewell to one emperor and welcome another, the imperial family is celebrating another milestone today: the 60th wedding anniversary of Emperor Akihito and Empress Michiko. Here's a look back at the couple's wedding, which took place in Tokyo six decades ago today. There was some push-back to Michiko's commoner status by those who had expected the future emperor to find a bride among the ranks of the kazuko, the former Japanese hereditary peerage. Others objected to the fact that Michiko had grown up with Catholic parents and was educated in Catholic schools. Ultimately, though, neither her class status nor her religion ultimately prevented the match from going forward. 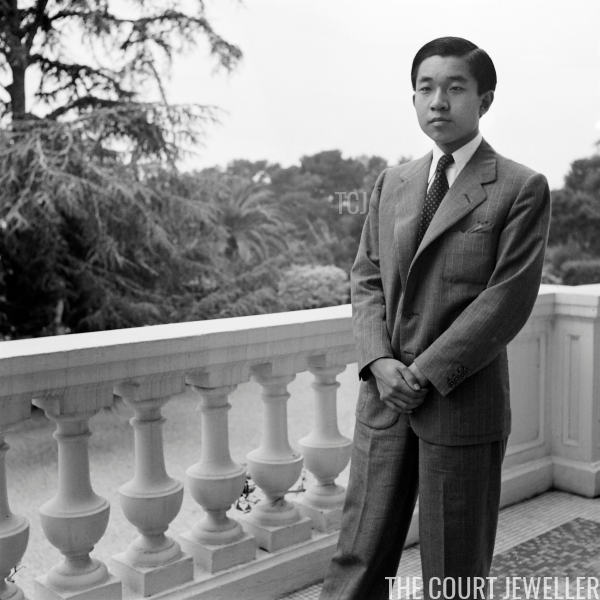 In the midst of a post-war movement for less rigid and more modern social structures, many Japanese people seemed delighted that their future emperor was marrying for love. Indeed, one of the biggest public problems reported ahead of the wedding was a "business crisis" -- too many women were preemptively quitting their jobs to try to coordinate their weddings to match the precise time and date of the imperial couple's expected nuptials. The royal engagement was announced to the public in November 1958. 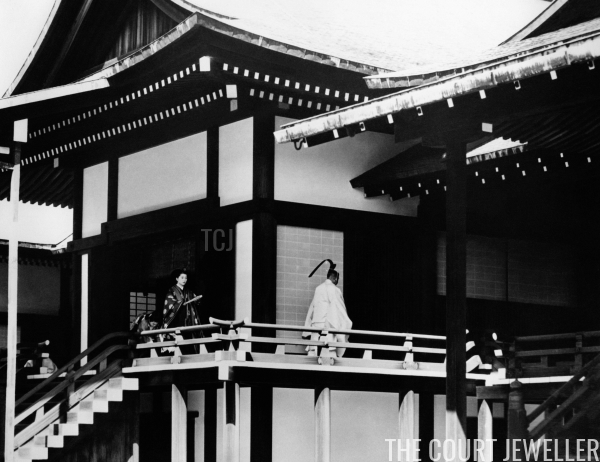 A few weeks later, in January 1959, the engagement was sealed with a formal ceremony at the Imperial Palace. 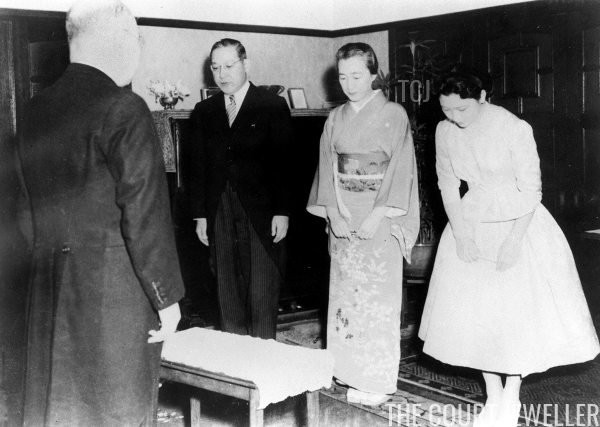 Akihito prayed in one of the palace's shrines after dispatching an official gift -- two fish, six bottles of rice wine, and five rolls of silk -- to the Shoda home in Tokyo. With her parents standing beside her, Michiko softly replied "I will accept" when the gifts were presented by an official palace envoy. The wedding date was officially set for April 10, a national holiday was declared, and preparations kicked into high gear. As is so often the case, speculation immediately focused on who would make the bride's attire for the wedding. Just like today, young women immediately honed in on Michiko's fashion sense, copying her ladylike style of dresses and her preference for clothing in shades of white, beige, and blue. American newspapers reported that a "Michi boom" was taking place in Japan, "with department stores copying her hair-do and costumes, and magazines selling out every issue in which photographs of her are featured." It was decided early on that Michiko's junihitoe kimono for the Shinto ceremonies on her wedding day would be her "something borrowed" -- the same elaborate garment worn by Akihito's eldest sister, Princess Shigeko, during her wedding in 1943. (The kimono belonged to Akihito and Shigeko's mother, Empress Nagako.) But the press mused that perhaps a famous French couturier would be chosen to make the Western-style formal dresses for the celebrations. The Imperial Household Agency shocked many when they announced that Harue Matsuda, a Japanese department store designer who graduated from fashion school in Honolulu in 1941, would be designing formal attire for Michiko, including several Western-style gowns. Two other designers, Chiyo Tanaka and Kay Kumakiri, both of whom had previously made clothing for the ladies of the imperial family, were also announced as future dressmakers for Michiko. 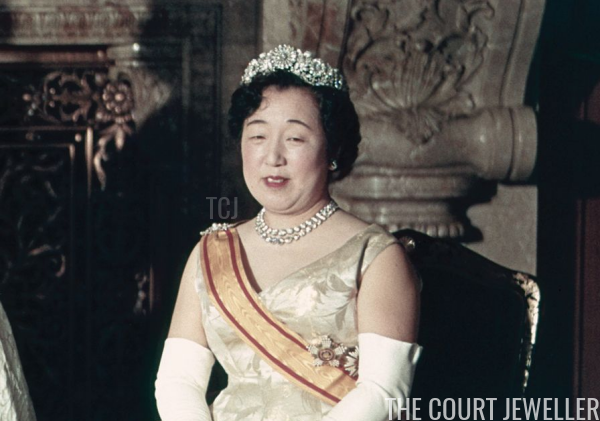 But it was Matsuda whose appointment was the cause for comment, with the Associated Press quoting one aspiring designer who "tearfully" exclaimed, "This is more fantastic than the selection of a miller's daughter as the future Empress of Japan!" Not quite -- Matsuda did have connections to the imperial family, as her aunt, the wife of a Japanese diplomat, had previously designed clothing for Empress Nagako. As the wedding date drew closer, commemorative stamps featuring pictures of the couple were released, and newspapers were full of images of the pair playing tennis and viewing photograph albums. Department stores began selling copies of the tennis outfit Michiko wore when she and Akihito met, while hairstylists offered to give women the perfect Michiko haircut. In the United States, Akihito's former English tutor, the American author and teacher Elizabeth Gray Vining, wrote a profile on her former pupil that was printed in news magazines across the country. (She received an invitation to the imperial wedding.) 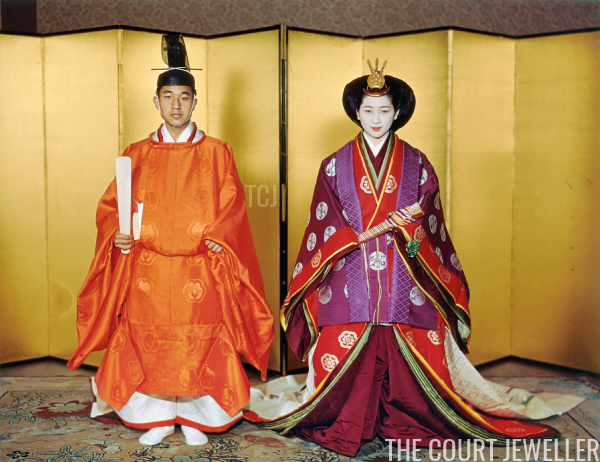 The Imperial Household Agency announced that the couple would indeed be accepting wedding gifts -- with restrictions. Monetary gifts would not be received, and neither would "gaudy gifts," which one American newspaper clarified meant presents like trendy Hawaiian shirts, as the couple would be "not likely to wear" them. 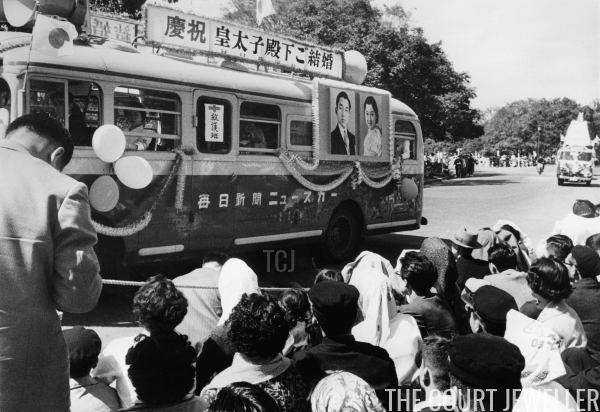 On the morning of April 10, Akihito and Michiko arrived separately ahead of their wedding. The traditional Shinto ceremony was held at the Three Palace Sanctuaries on the grounds of the Imperial Palace in Tokyo. Michiko arrived separately to prepare for the wedding ceremony. A few days earlier, she had given a brief interview to the press. Her statements reveal that she clearly understood the burden that would be placed on her as a member of the imperial family and a future empress consort. "I am passing each day wrapped in an indescribable state of tension," she told one reporter. "I am praying in my heart that I may be able to carry out, somehow, the heavy responsibilities that lie ahead without making any serious mistakes." Shortly before the wedding, the Edmonton Journal previewed the complicated process of putting on the traditional attire for the wedding ceremony: "It will take Miss Shoda two hours and 40 minutes to slip into her wedding dress. She will be forced to bear up under 12 layers of kimono with the outer one a silk piece in orange red. Extra hair will be woven into her own to give her a coiffure that rises and then falls back into a ponytail." The Journal also noted, "Akihito will wear a pair of wide silk pants that will cover his feet and form a train in the back. Michiko will also wear a similar pair of pants. Neither will be able to move without their retainers' help." Here, you can see Akihito being helped while wearing his attire. 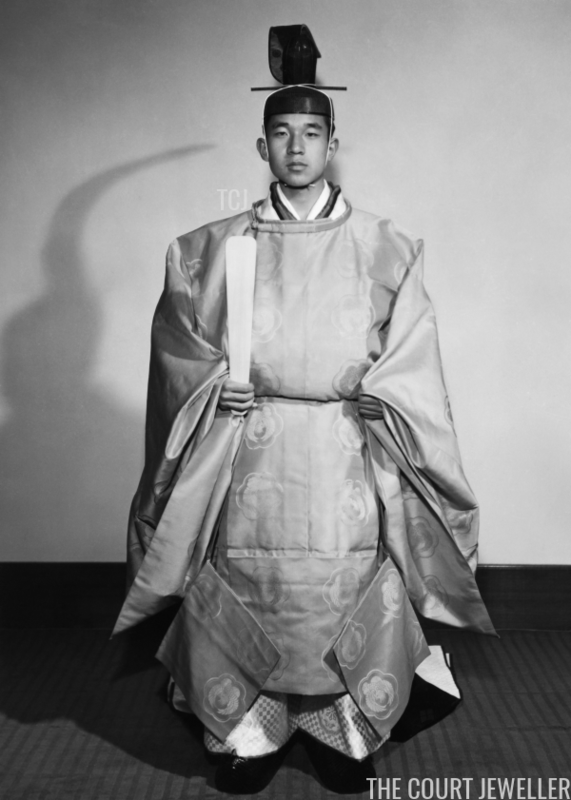 And here's a better look at Akihito wearing the layered, complex sokutai on his wedding day. He holds the flat scepter, the shaku, and wears a traditional hat, the kanmuri. 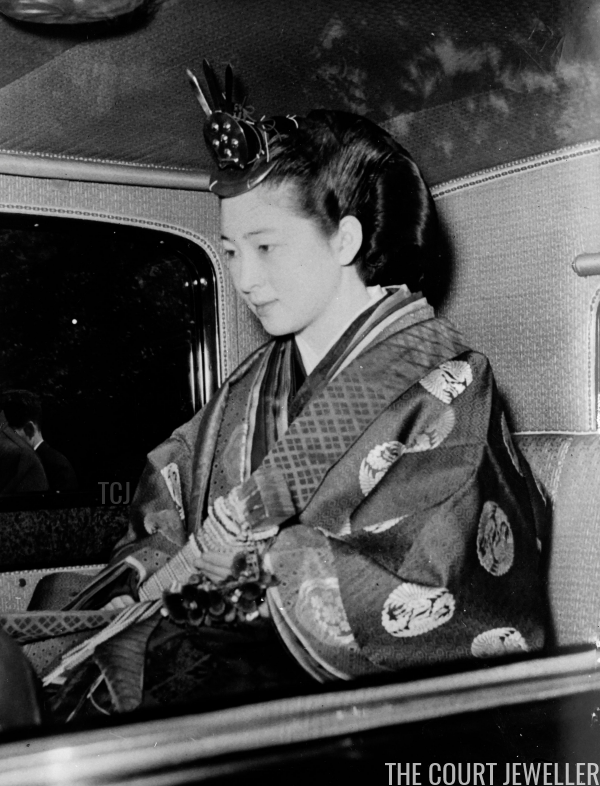 Michiko was also helped separately to process to the ceremony, which was held in the palace's central shrine, the Kashiko-dokoro. There, more than 900 wedding guests awaited, including her parents and 26 members of the Shoda family. More than 40 members of the imperial family were also in attendance, including Akihito's aunt, Princess Chichibu; his uncle and aunt, Prince and Princess Takamatsu; his younger brother, Prince Masahito (now Prince Hitachi); and his youngest sister, Princess Takako. 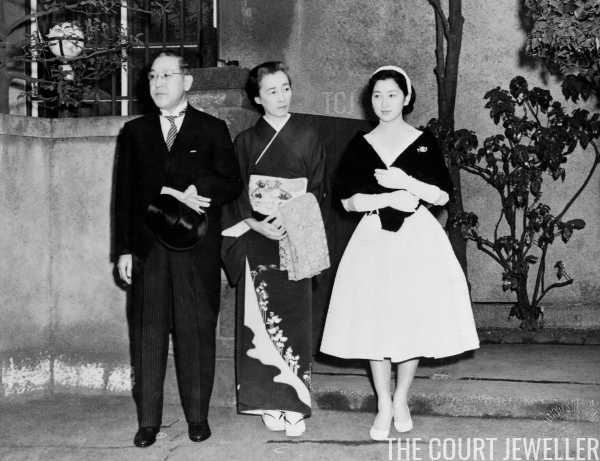 Following custom, neither Emperor Hirohito nor Empress Nagako attended their son's wedding ceremony. 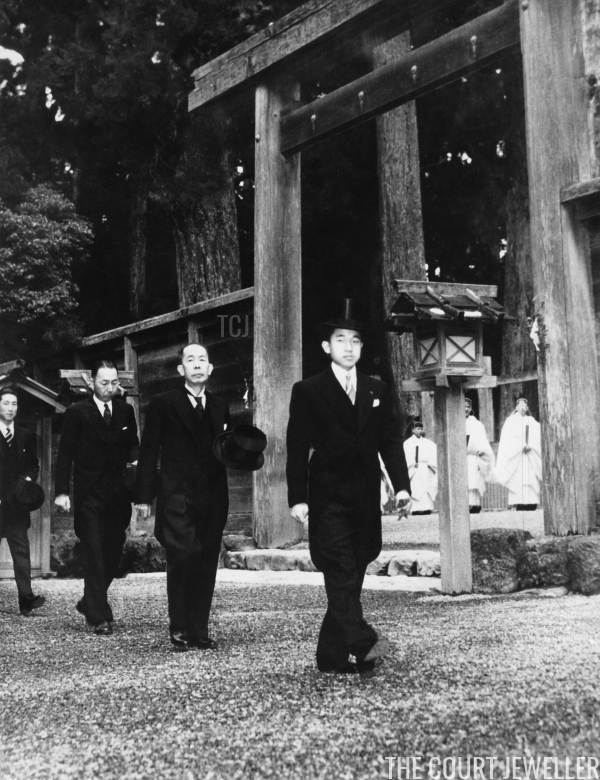 The Boston Globe offered a narration of the wedding service itself for its American readers: "Akihito entered the inner kashikodoro or inner sanctum at exactly 10:01 a.m. and was followed 30 seconds later by Michiko .... Akihito walked 14 measured steps to the entrance of the inner sanctum, followed by the chief chamberlain and his sword bearer. Princess Michiko followed, already looking like an empress. Fireworks and salutes broke out in the background, while the couple knelt at the inner shrine and Akihito reported to his ancestors and knelt before a replica of the sacred mirror, one of the three most sacred relics of the Imperial family. The final ceremony started at 10:09 in the outermost room. First Akihito and then Michiko sipped sake and the marriage was complete. At 10:12 the chief ritualist closed the curtain, bowed in his snowy white robes, and led the procession out." 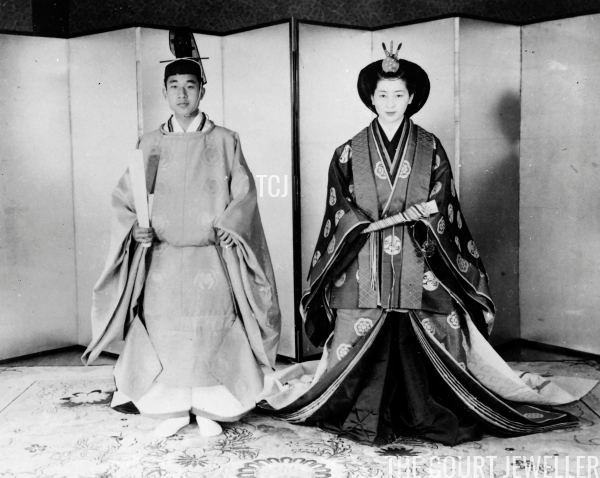 After the wedding, Akihito and Michiko changed out of their traditional attire and into Western-style clothing for the choken-no-gi, the audience in which they announced their marriage to the imperial couple. 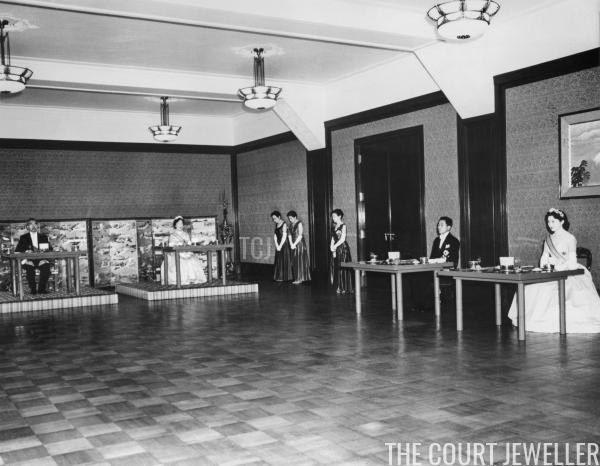 They greeted Emperor Hirohito and Empress Nagako and were seated for a symbolic meal of fish, rice, and sake. The emperor, empress, crown prince, and crown princess placed silver chopsticks in their bowls of rice, but, as part of the ritual, the food remained uneaten. A sake toast followed. 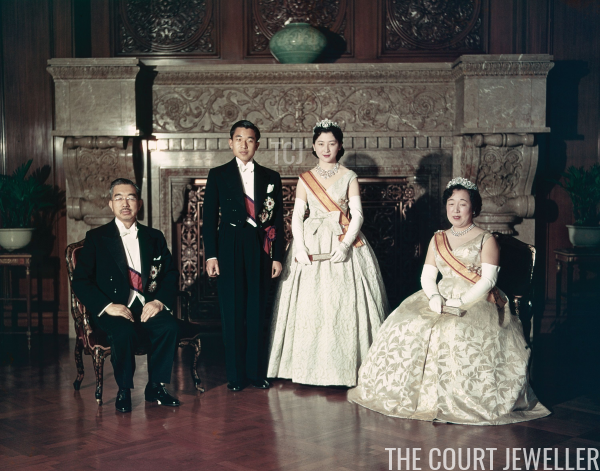 When the ceremony had finished, the imperial family posed for a formal photograph in their suits, gowns, and tiaras. 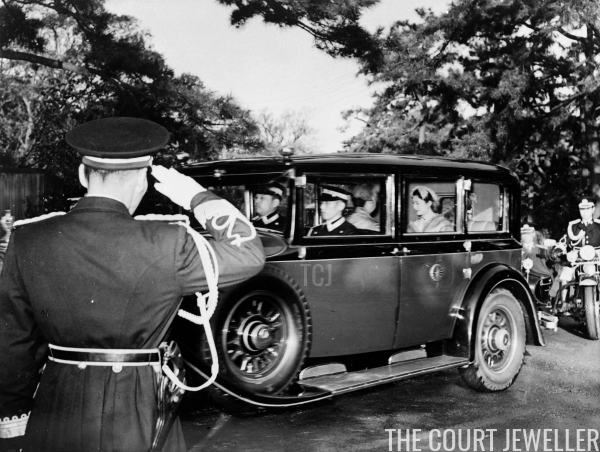 Both Emperor Hirohito and Crown Prince Akihito wore the crimson sash of the Order of the Chrysanthemum, the highest-ranking order of Japanese chivalry. 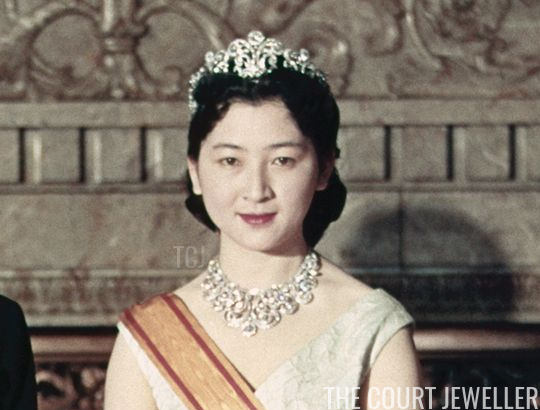 Empress Nagako wore the Order of the Precious Crown with one of the grandest tiaras in the Japanese imperial vaults: the Imperial Chrysanthemum Tiara. (Read more about it here.) She also wore a double riviere of diamonds. As with all royal weddings, however, there was one note of discord struck during the day. As the crown prince and crown princess departed the imperial palace in a horse-drawn carriage, an angry student rushed out of the crowd toward the couple. 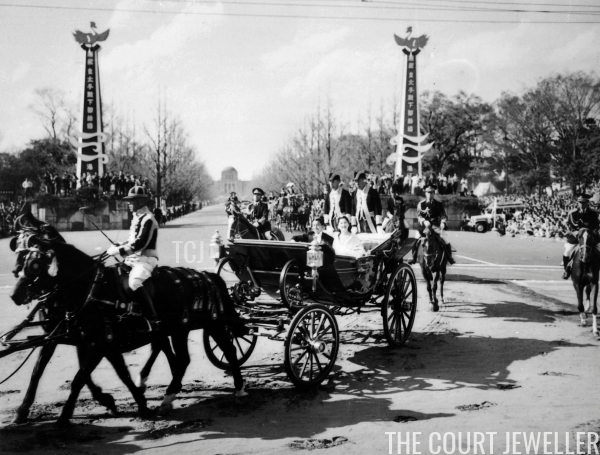 The 19-year-old "flung a stone at the royal couple then tried to clamber aboard their maroon and gold carriage. Two liveried footmen flung him to the ground before he could touch the imperial couple and eight policemen dragged him away." The student, not a fan of monarchy, reportedly told the police, "I don't believe in the Emperor system and I never have. I was so mad I decided to drag the couple from the coach." The paper reported that Michiko briefly "shrank back" in surprise as the teenager approached, but "the glittering procession continued along its way" afterward. 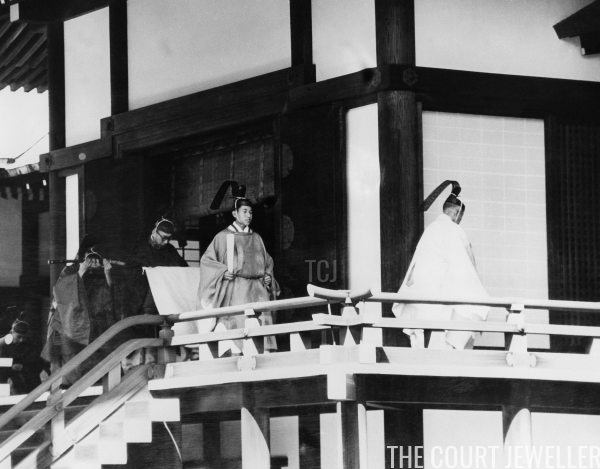 After a whirlwind of post-wedding ceremonies and celebrations, the crown princely couple finally got to enjoy a ten-day honeymoon at the Hayama Imperial Villa on Sagami Bay. Now, 60 years later, they're approaching the end of their own 30-year reign as emperor and empress. Akihito will abdicate on April 30, making the couple's elder son into the new Emperor Naruhito.